Whiskey drinkers looking for a unique drinking vessel or those searching for a unique present for a whiskey drinker, may be interested in a new oak Whiskey Glass with a traditional whiskey glass shape. Handcrafted from American oak and finished with a natural sweet beeswax to provide a warm and pleasing goblet to enjoy a favourite whiskey. Each American Oak Whiskey Glass is shaped from natural unprocessed oak that has been carefully selected say its creators SIPDARK. As you can imagine with each being made from wood every glass is unique with variations adding to the overall ascetics. SIPDARK explains more about the inspiration behind their handmade oak whiskey glass just this week been launched via Kickstarter and is now available to back with pledges starting from just $15 and shipping expected to take place during January 2018. 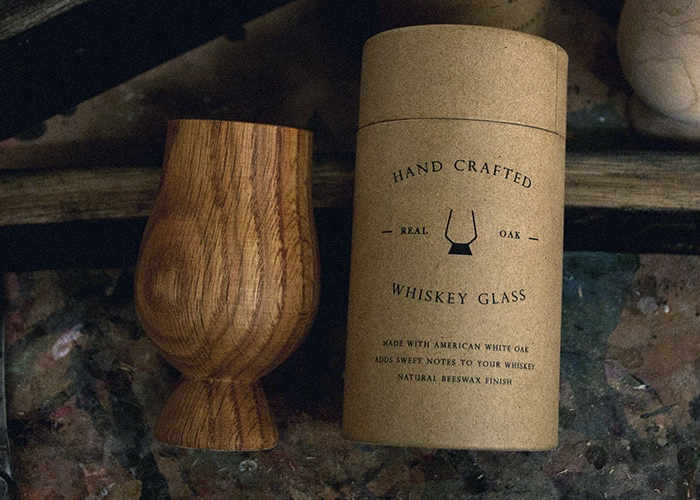 A handmade oak whisky glass that enhances your drinking experience. Our glass is sealed using beeswax that helps keep the wood protected while adding some sweet flavors and notes in the process. Its design is influenced by the notable “tulip” shape which helps direct appropriate and more complex aromas to your nose. This glass is more durable and less refined than the traditional whiskey glass but it definitely serves the purpose and function. Wood has always played a huge part of the whiskey-making process. Oak barrels have been used to hold, age and flavor the whiskey for centuries. With this glass we have taken the step of reuniting the whiskey again with natural oak adding a bit more to the flavor and experience. To place your order jump over to Kickstarter via the link below.